We set off on our 2+-hour tour of Vienna armed only with a large, unwieldy map in German/Austrian that only showed the streets on one side. Descriptions of buildings and sights were on the only on the back. 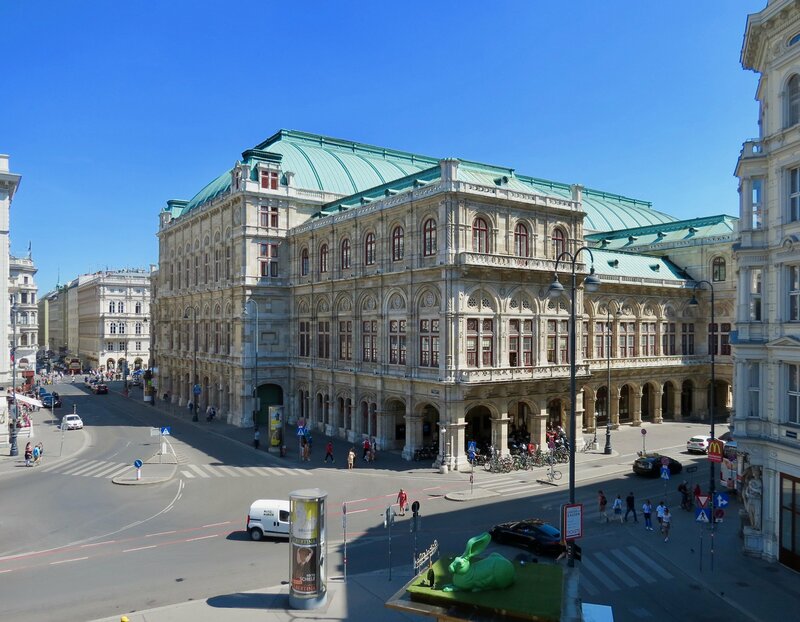 Though we weren’t thrilled about feeling as if we had been dumped into the city, we bravely embarked on our brief but intense tour of Vienna. We stopped to look at the exterior of the Opera House then headed toward a place to eat. I recognized that the Sacher Hotel was likely to be the place where the Sacher Torte cake was invented, so we stopped there to have a snack–my Sacher Torte was just ok, a bit dry, but Rick’s chocolate molten cake was tasty. traced on the map where we were walking in order to later identify what we had seen. The buildings’ names were in German/Austrian, thus even those were only guess-able. My overall impression was that the Habsburgs’ Beaux Artes and Art Nouveau architects and designers “frosted” all buildings with lacy accessories, statues, urns, carvings, ceramics–5 times more than needed! That is my best description of Vienna.